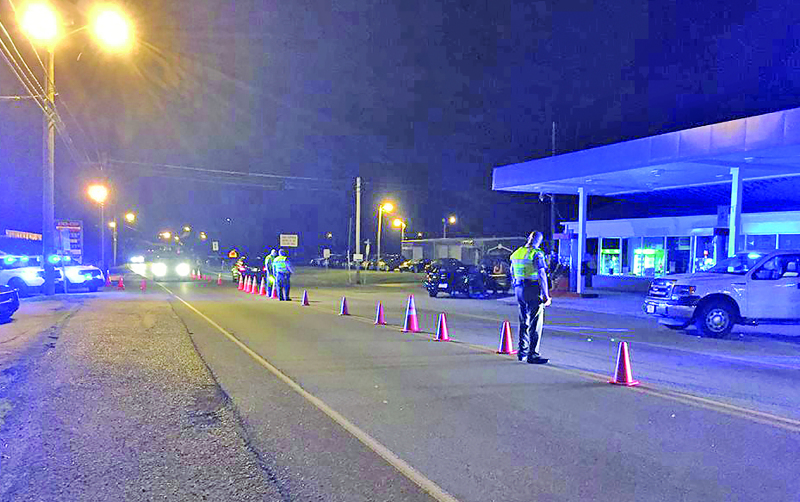 Officers from the Cannon County Sheriff's Department and the Woodbury Police Department conducted a safety and sobriety checkpoint on McMinnville Highway from 9 to 11 p.m. on July 2, with overtime provided by a grant through the Tennessee Highway Safety Office. Over 400 cars passed through the checkpoint manned by 14 officers and multiple violations were cited. Citations include: four driving while license revoked, suspended, or canceled, one headlight violation, two financial responsibility violations, three seat belt violations and two child restraint violations. Also during the checkpoint Trevor Eli Smith of Woodbury, who admitted to drinking when he passed through the checkpoint, was ordered to pull over to the side. Before officers reached his vehicle, he fled the scene. Smith was apprehended shortly thereafter on Water Street after leading officers on a brief chase through Woodbury. He was charged with Violation of Implied Consent Law, Reckless Endangerment, two counts of Evading Arrest and Vandalism. A DUI charge is pending, awaiting blood results due to refusing to do any field sobriety tests. His bond was set at $13,000 and his court date was set for September 6. After the checkpoint some officers also conducted a saturation patrol in which three speeding violations and one registration violation were cited.